You would know Yukie Shaw from her UNIQLO/Rosebullet-esque getups and her blog Tokyo Mode Addict. 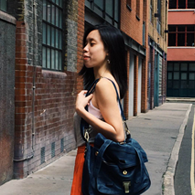 This Singaporean-Japanese blogger has her roots in Japan and is a regular in Tokyo. Yukie talks about navigating the busy city, Tokyo’s best dry ramen, and a traditional teahouse you just can’t miss. What should travellers know about Tokyo before heading there? Rely on google maps with your life when in Tokyo! The city’s train map is as crazy as the people are. It really is best to have mobile internet when commuting in Tokyo. What do you feel defines Japanese cuisine? I would describe Japanese cuisine as homely. Considering that I was raised by a Japanese mother, I know that sounds like I am tooting my own horn. But the people there are gentle with their flavours. And no matter where you eat, you can feel a sense of pride on a plate. What is the one local dish you feel travellers can’t leave Tokyo without trying? Abura Soba! Hands down. It is basically a dry version of ramen, and better! Omotesando is the best area to find Tokyo-style café food with its Japanese-Western menus. I really miss sitting in a pretty cafe and having things like negitoro-don or a loco moco with friends over lunch on a weekend. Some of my favourites are Bills, BOWLS Café and Madosh! Café. What is a typical Japanese breakfast for you? Grilled salmon, soup and white Japanese rice! And it doesn’t get any better. Do not leave your chopsticks poked in to your rice! It resembles as joss sticks in Japan, even for a short while. If you need to put your chopsticks down, place them back on the rests or on top of your bowl. There is a quiet and quaint breakfast/tea house in the middle of Nakameguro, called Yakumo Saryo. By reservation only. I do love young, modish brands like MURUA and The Dayz Tokyo. Convenient stores. Try not to let them take all your money. I went on a drive to Lake Kawaguchi once with fellow blogger Andrea Chong, two hours away from the city. It was breathtaking! For me, it depends which season of visit. Japan’s obvious secrets glisten with her seasons. My favourite time in Tokyo is Christmas. Some of my must-dos are shopping around Ginza or Shibuya, going to restaurant that serves fresh winter produce, and taking a long night walk at illumination spots in Tokyo.